The human body consist of several organs. Each organ has their function inside the human system. Similarly, the human abdominal cavity is composed of several organs. A thin tissue covers these organs – like or skin – like the membranous cover that is also known as the peritoneum. This membrane forms the key to providing the necessary support to the abdominal cavity. In addition to this, the membrane functions as a channel for the nerves, lymph and blood vessels. The organs that are present within the inner layer of the peritoneum is referred to as intraperitoneal organs. It is of utmost importance to be aware of the functions of these organs in the human body. The peritoneum could be defined as the form of lining that covers the abdominal organs. Most of the organs that are covered by the peritoneum are known as intraperitoneal organs. The peritoneum is composed of a layer formed from mesothelium and is supported by the means of a thin connective tissue. In addition to the above, the peritoneum is also responsible for developing the key support of the abdominal organs. It also is a channel for the nerves, lymph and blood vessels. Sometimes, people tend to confuse the abdominal cavity with the intraperitoneal space. In addition to the above – mentioned functions, the peritoneum is responsible for secretion of a fluid. This particular fluid fills up the abdominal cavity, and a perfect environment is formed with the presence of protein and nutrients. The fluid has lubricating qualities and helps the slight movements of the abdominal organs. 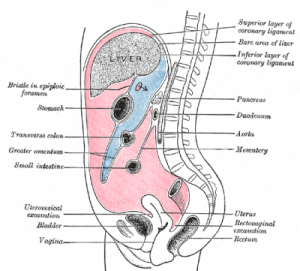 However, it is interesting to know the difference between the male and female peritoneal system. The peritoneal cavity of the males is said to be closed. The peritoneal cavity of the females can communicate with the reproductive organs and is said to be open. This might be the reason the uterus, ovaries, gonadal blood vessels and the fallopian tubes are present inside the peritoneal inner part. However, it is crucial to know the fundamental difference between the abdominal cavity and the intraperitoneal space. The intraperitoneal space is inside the cavity, and an example of such an organ in the human system could be the kidneys.